Help your students develop the Microsoft© PowerPoint© 2016 skills they need to be successful in college and beyond with the emphasis on critical-thinking, problem-solving, and in-depth coverage found in NEW PERSPECTIVES MICROSOFT© OFFICE 365 & POWERPOINT© 2016: COMPREHENSIVE. Updated with all-new case scenarios, this comprehensive edition guides students in applying the skills they are learning to real-world situations to emphasize the relevance of concepts. New Productivity Apps provide a visual introduction to Microsoft© OneNote, Sway, Office Mix and Edge with fun, hands-on activities for active learning. Companion Sways provide videos and step-by-step instructions to help students learn to use each app. 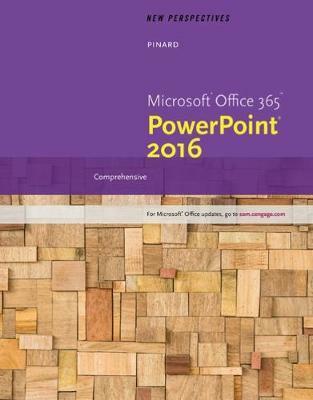 With an unmatched emphasis on learning outcomes and transference of skills, NEW PERSPECTIVES MICROSOFT© OFFICE 365 & POWERPOINT© 2016: COMPREHENSIVE engages students by clearly demonstrating the importance of what they're learning.